Sunday, March 1, 2015, 1-3 p.m.
As an artist, Mo is an existentialist, whose major controversial works could not be exhibited in China. He is kept under constant surveillance, has his works confiscated, passport removed; yet he refuses to compromise. He is committed to testifying what he believes to be the truth and continues to paint inside his own studio. Absorbed is the most appropriate word to describe the feeling of any audience standing in front of Mo's works. They will simply take you by the heart. June 4, 1989 is a date explicitly being erased from the chronograph of Chinese modern history by its own government. Mo painted a series of this day of massacre. Mo always paints directly out of his own memory and poetic imagery with bold and dynamic brush works. This huge "Rising to the Sky" is lyrical and romantic. Crowds of students flocking into the sky blocking the tank from entering Tiananmen Square. To dramatize the scene, he adopted the ballet posture from the Culture Revolution. 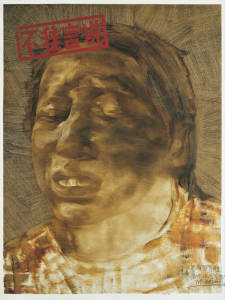 "Thou Shall Not Speak" is a massive portrait describing the Chinese folks under repression.